A Dogs Way Home is a beautifully told, charming tale that explores the unbreakable bond between us and those we love. This is a fantastic and exhilarating journey of the heart that brilliantly speaks to the incredible power of love and resilience of spirit that tie us together. Start reading A Dog's Way Home on your Kindle in under a minute. W. BRUCE CAMERON is the #1 New York Times and USA Today bestselling author of A Dogs Purpose, A Dogs Journey, A Dogs Way Home (all now major motion pictures), The Dog Master, Ellie's Story, Mollys Story, Maxs Story, Shelbys Story, The Dogs of Christmas, The Midnight Plan of the Repo Man, and others. He lives in California. 5.0 out of 5 starsAnother W. Bruce Cameron "must have"!! I finished reading "A Dog's Way Home" and first thing this morning was a plan to write a review. I was luckily chosen by the publisher to read an advanced copy of the book. W. Bruce Cameron's books have been my favorites, and this one is right at the top. A Dog's Purpose will always be my favorite, as it was the first "dog" book of his. But "A Dog's Way Home" is right up there. This book, as are the others, are written from the point of view of the dog. In this case, a possible Pit Bull mix, named Bella. She, as all dogs I've known or have been part of my family, does all she can to please her "person". She wants to be a "good dog", she wants to "give comfort", she wants to do all of the things that all of our pets want. And, as usual, she learns these things from her "person". However in this book, Bella, the mix pit bull, is not "welcome" in the town she lives in, in fact, she is legally banned as animal control deemed her a "pit bull", that legally can be taken by animal control and put down. Her person does all he can to keep her with him, she gets lost. She learns things from other people and other animals on her travels of trying to "go home", all things that kept her alive, as she helped others live. While lost,she gave comfort, was a good dog, and at times, knew she was doing something that her person would tell her she was a bad dog. But, it was all in the quest of "Go Home". It amazes me that Mr. Cameron can "be the dog" as he does....My little dachshund is a work in progress to being "Bella". This book is working to remove the stigma of pit bulls and other dogs that some consider "dangerous". I've always known that pit bulls can be soft and gentle. Any dog can. Any dog can be mean, angry and dangerous, if that is what their owner teaches them to be. That's the problem, some pit bulls and others were taught this. Bella was taught to be "a good dog". Not all pits or similar are mean by nature, they are taught that. It's not the dog, it's the person! For this wonderful book, if Amazon permitted 10 stars or above, that is what I would give it. An amazing book that I hope will help remove the stigma on breed specific dogs, as they are not "bad dogs", they were just not taught "LOVE". Hopeful that Mr.Cameron won't mind, a one line quote from this book that stood out to me, Bella had a thought "If a dog couldn't trust humans, how was life even possible"
Keep on writing Mr. Cameron, this "person" will continue to read! I learned something with this book – that I need to stop being surprised just how good W. Bruce Cameron truly is. I have loved all his books – from the No. 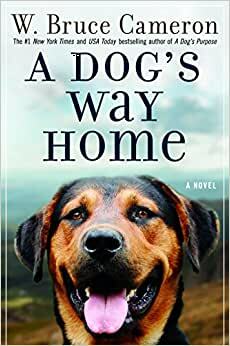 1 best-seller "A Dog's Purpose" to his "Repo" series and everything in between, but his latest, "A Dog's Way Home," is as much a delight as anything he's done. Once again, Cameron is telling a story from a dog's point of view, and he doesn't disappoint or, most importantly, repeat himself. There are certainly those elements that fans of Cameron crave – the humor, the warmth, the emotion, and a gosh darn good dog, but there is also a call to arms in this book, which deals with unfair laws in some parts of the country that are outlawing pit bulls. What Cameron always does best in his books is to drive home a message, and he skillfully does that here. You will pull for Bella every step of the way in "A Dog's Way Home," and you will feel strongly about many of the human characters, too, which may be the best part of the book. Cameron has always made readers love the characters in his book – be they human or canine, but "A Dog's Way Home" in, however strange this may sound in a book about a dog, it was the humans who ended up starring in this great wag-of-the-tail tale. Dog lovers will see a little bit of themselves in the various humans who, in their own ways, loved Bella, needed Bella, found comfort in Bella. It was a joy to read this book. Pure joy. This is wonderful story about a short-haired muscular mutt struggling to find her way home. Bella was seized from her owner because of Denver's breed discriminatory law. The book was so engaging I actually stayed on a plane to finish it while the rest of the passenger's deplaned-and that has NEVER happened. Let's hope folks who live in communities with breed specific or breed discriminatory laws buy copies of this book for their public officials and rise up to get breed discrimination repealed. Politics is not a spectator sport. In America responsible dog owner's should be allowed to own whatever breed of dog they choose. It's that simple. I had the good fortune to receive and read an advance copy of this book from the publisher. W. Bruce Cameron has outdone himself once again. Bella, a mixed breed puppy, is labeled a pit bull in Denver, where they are illegal. She is taken to a foster home in Durango until her person, Lucas, can find a place to live where she will be allowed. Bella only knows that she must Go Home to her person and escapes. From there she embarks on a long, adventure filled journey back to Lucas. Told by Bella, this book touches on many subjects including veterans and PTSD. It will make you laugh, cry and celebrate the compassion and unconditional love of animals. There are new friends to meet such as Mother Cat, Big Kitten, Dutch and many others. Cat lovers will love this dog book! I'm ready to read it again.